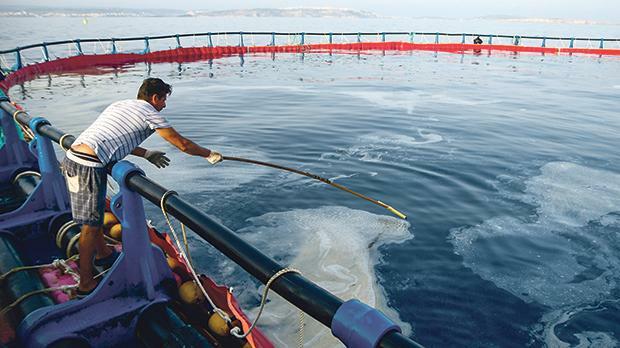 Fish farm operators are selling the slime collected in booms for various uses, including medicine, a representative for the Federation of Maltese Aquaculture Producers said. The slime is currently being exported and being refined, federation secretary John Refalo said. “It is a natural product – the slime is made up of fish oil residue from tuna feed like mackerel or sardines. The product starts to deteriorate if it is not collected immediately,” Dr Refalo explained. Fish oil is found in various health products on the market, Dr Refalo added. The federation secretary was speaking on the fringes of a three-hour boat trip in which journalists were taken to view fish farm cages. 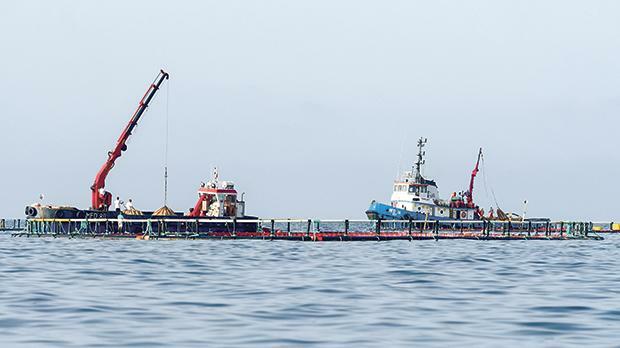 During the trip, Dr Refalo and recently instated federation head, Charlon Gouder, said the booms and self-regulatory measures were helping in the fight with the slime that has plagued Malta’s beaches in the summer. Coasts in Marsascala and Sliema have been hit with oily slime this year. In 2016, tuna farms around the island were identified as the source of the widespread incidence. Asked if the new measures could guarantee that slime would not end up on shores, Dr Refalo said he could “guarantee that we will keep doing what we are doing and include better systems to minimise and reduce the waste of our product”. “Incidents will happen no matter what,” Dr Refalo admitted. Slime collected from fish farms could end up in medicine. The re-emergence of slime prompted a swift response from the fish farm operators lobby group this year. 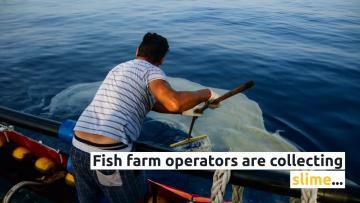 A visit to a fish farm site showed workers using a squeegee to push the slime into fish pens towards what is known as a “skimmer” – a device that collects and removes oil from the surface of the water. Fish farms are also refraining from feeding fish during stormy weather, for fear that the slime generated would make its way beyond the cage because of rough winds or currents. “We are building up our capacities to ensure that even if we do have an incident, we can intervene immediately,” Dr Refalo told reporters yesterday. He admitted the mitigation measures were a learning process and more could be done to minimise and reduce waste. Operators had also set up a call centre to receive complaints from members of the public and would be covering expenses for two boats to patrol the coast and collect marine litter, the federation said.